A unique and practical holiday gift for the gardening afficionado, or anyone who could use a hand in the garden, is a custom gift certificate. 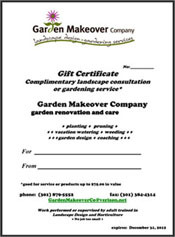 Garden Makeover Company offers gift certificates in any denomination, tailored to the sender’s request — e.g., for a garden consultation or coaching session, or for any hands-on gardening service. It can be used to purchase a nice floral gift item, such as hanging baskets or containers, or an array of annuals that can be planted on site. We can tailor and mail the certificate directly to the recipient or to the gift-giver. 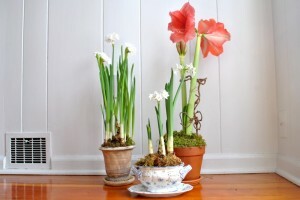 Flower bulbs for forcing indoors make nice winter gifts.